Photographs and text by Jacqueline Banerjee, 2012. The photographs are reproduced here by kind permission of the Chapter of Lichfield Cathedral. Click on the images for larger pictures. 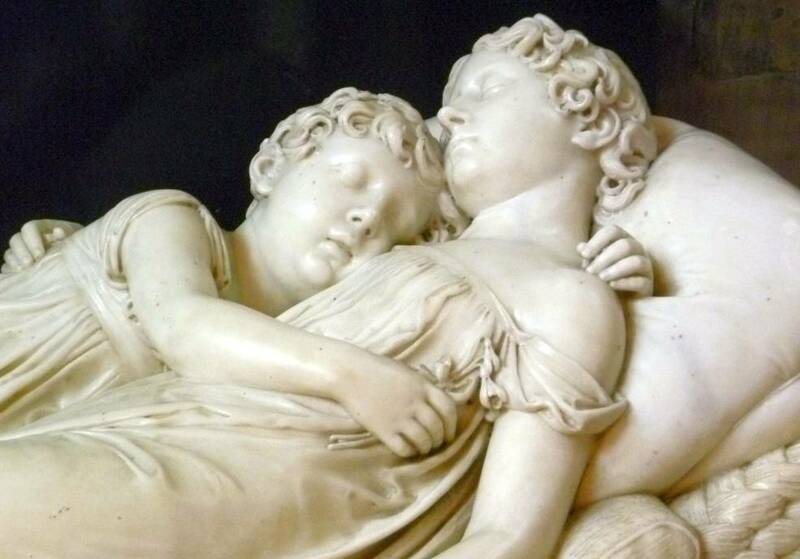 The Sleeping Children by Sir Francis Chantrey (1781-1841). 1816, exhibited 1817. Carrara marble. South Choir Aisle of Lichfield Cathedral, Warwickshire. "Such was the press to see these children in the London Exhibition [at the Royal Academy], that there was no getting near them; mothers, with tears in their eyes, lingered, and went away, and returned" (Holland 270). The memorial was so popular that "small replicas of it were sold" (The Carvings of Lichfield Cathedral). The work commemorates the lives of Ellen-Jane and Marianne Robinson. Their mother had recently lost her husband, the Rev. W. Robinson, when her elder daughter was fatally burned after her nightdress caught fire; not long afterwards, the younger girl fell ill and died. Trebly bereaved, the mother had yearned for a monument, dwelling on the way the girls used to sleep affectionately twined in each other's arms. The children's drawing master had already called in Chantrey to make a mask of the younger child's face; so Chantrey set to work on a model of this "universally admired" masterpiece (Notes and Queries, 94). Closer view of the children. 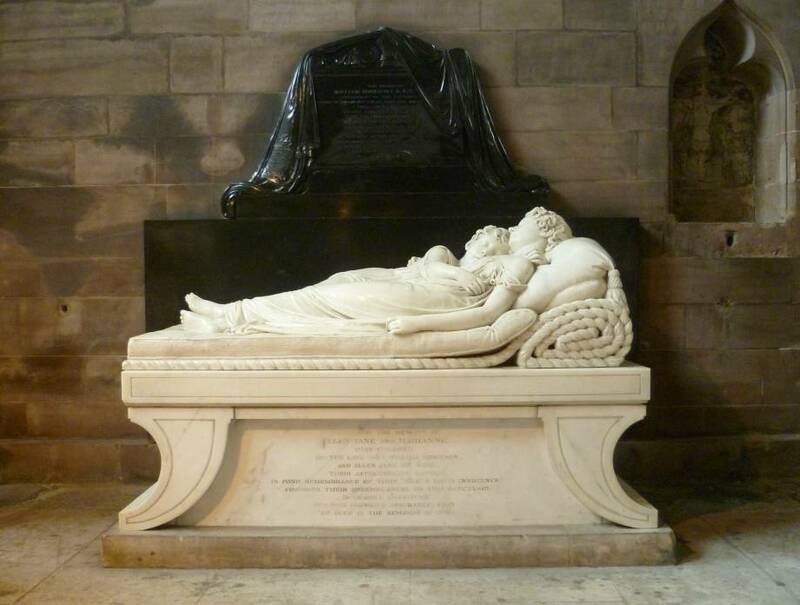 Chantrey was influenced by having seen Thomas Banks's well-known monument to Penelope Boothby in the lovely church of St Oswald, in Ashbourne, Derbyshire, which he had visited at Mrs Robinson's suggestion (see Dunkerley 39). This shows a five-year-old girl, gown beautifully spread out right to her ankles, seemingly asleep on her bed. Then in 1850 came the suggestion that Chantrey's whole composition was first drawn by the artist Thomas Stothard (1755-1834). According to a correspondent to Notes and Queries, however, Stothard was responsible only for drawing Chantrey's model later, so that the mother could see it before it was made up. Yet another correspondent to the same issue of the same journal, Peter Cunningham, defends Chantrey stoutly, but, while attributing the general composition to him, does say that it was his father (Chantrey's devoted chief assistant, Allan Cunningham, 1784-1842) who suggested the poignant touch of the snowdrops still there in the hand of the younger child (see 94). Details from each end of the figures, showing the mattress and pillow as well. In general, Peter Cunningham feels that trying to detract from the sculptor's own authorship of the work was simply the ploy of those "envious of Chantrey's rising fame" (94). It is interesting that Chantrey's stock should have been "rising" nearly ten years after his death. Of course, this work is exactly the sort of thing that Victorians loved, and a fine example of it too. As one might expect from Chantrey's having taken a death-mask, the children's faces are characterful rather than classically "ideal," and the details of the mattress especially keep it rooted in reality. It is not, after all, and despite the symbolism of the plucked early flowers, a sentimental. piece. Compare it with Baron Marochetti's similarly successful and touching Bimba Dormiente. The whole correspondence in Notes and Queries gives a fascinating insight into the sculptor's profession, particularly into the involvement of others, besides the sculptor himself, in a work's evolution. Where those other people were thought to have been too heavily involved, there was apt to be criticism. But criticism on that score seems unwarranted here. Nor is there any hint in this delicately carved work that Chantrey could really have founded the "coarse and careless style of modelling and execution" that Francis Turner Palgrave so decried (qtd. in Read 20). 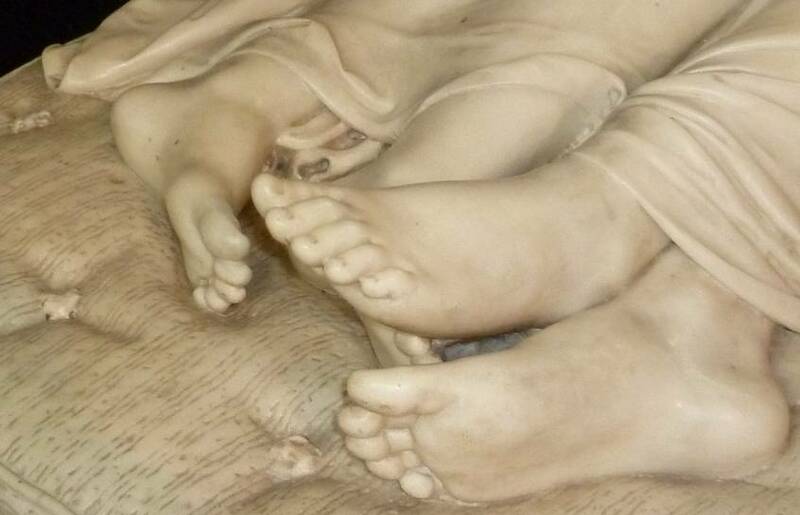 The little unfinished piece between the elder child's feet seems to be one of those instances where perfection is eschewed as an act of respect to the only true "Maker." 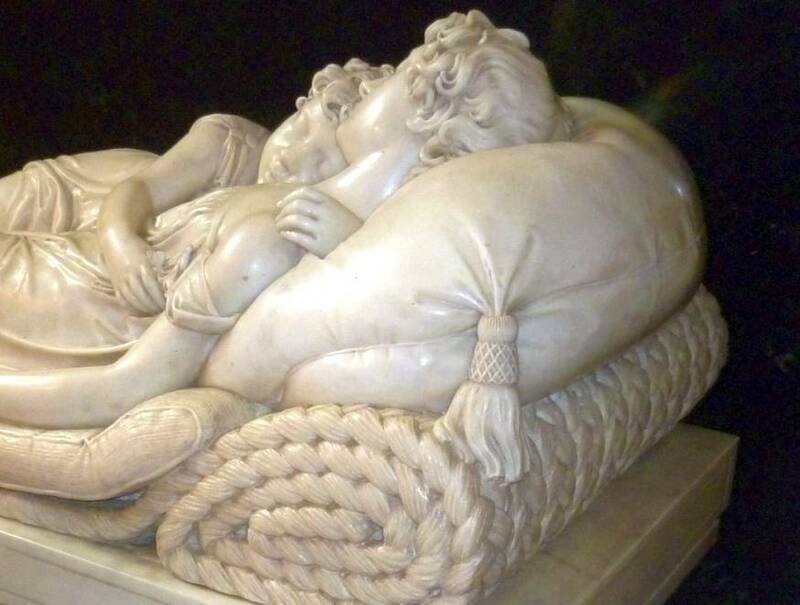 "Child Death and the Victorian Novel"
"De-Territorialisation and Re-Territorialisation of Death in Little Nell's Death-Bed Scene"
The Carvings of Lichfield Cathedral (2010). Booklet available at the cathedral. Print. Dunkerley, S. Francis Chantrey, Sculptor: From Norton to Knighthood. Sheffield: Hallamshire Press, 1995. Google Books (available for preview only). Web. 1 November 2012. Holland, John. Memorials of Sir Francis Chantrey, R.A., Sculptor, in Hallamshire and Elsewhere. London: Longman, 1851. Google Books (free e-book). Web. 1 November 2012. Notes and Queries. Vol. II, May-December 1850. Google Books (free e-book). Web. 1 November 2012. Read, Benedict. Victorian Sculpture. New Haven and London: Yale University Press, 1982. Print.